Congratulations to Tina Turner: last Monday, she was handed her Swiss Passport. Having lived in Switzerland for over 15 years, she is now an official citizen of the country. Newspaper Blick reports that on April 22, she visited the Swiss passport bureau in Zürich together with husband-to-be Erwin Bach. Formalities, including taking a photo, took about 15 minutes. Before being able to apply for the passport, Tina had to take a citizenship test and learn the German language. We wish Tina a lot of happiness in her life as ‘Schweizerin’! i am truly happy for you tina,i always liked you,i wish you and your fiance all the happiness,and more you two continue to enjoy your life.me and my husband would love to visit europe,perhaps even meet you.financially we can’t afford it right now,hopefully one day,god’s willing.god bless you tina. Thanks for your comment Bionetha. And this blog is not maintained by Tina or her team. Tina my mother use to say, God made this world for us to see it all and you becomming a citizen of Switzerland is a good example of that. I wish you the best life and a very, very happy marriage to come. I wonder will she have a large scale wedding or something more intimate. “Knowing” Tina Turner, i think she’ll go for the intimate version. TINA TURNER Im so happy for you..I look for VOGUE with you on it here in the states .I dont think we got that one here IM SO SAD….I always try to get anything with you on the cover..I love you , much blessing ..your a blessing to others..Enjoy your life many years to come..
You should try Ebay, there’s still a few copies available there! Deseo que seas muy feliz! por ser una mujer de un enorme talento, una inagotable capacidad de trabajo y una inclaudicable determinacion. Como quisiera que vinieras alguna vez a Argentina, por lo menos a pasear! While you’re at it, Tina, consider getting a Conch Republic passport the next time you’re in the Key West, Florida area. You’ve been here before – right? – in your “Ike and Tina” days? In fact, I’ve heard that you used Key West style cabdriver hospitality to get away from Ike for a while, and party! Of course, he might have been making it all up. Was he, Tina? Who’s the driver of the car in the picture with Tina? I think that is her Swiss friend Regula Curti, married wit the publisher Beat Curti. But not 100 % sure. They met Tina originally, because they lived in that lake villa before and Tina invited them for a dinner to find out more about the house. The two ladies got along well and became friends. 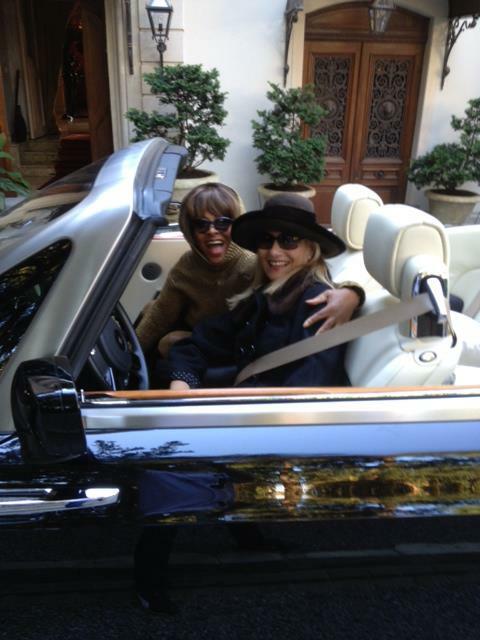 I believe the Rolls-Royce Drophead belongs to Tina though. Tina likes it in Switzerland, because it is unpopular to disturb prominent people in their private life. We fortunately also have not these regular paparazzi gangs. I passed her personally walking in Zürich once, while she was shopping, gave her just a smile and a “Hi, Tina!”. I got a smile and hi back. My sister sold her clothing in a store once and was one hour with her alone and not even asked for an autograph. It would have been impolite. She is very down to earth, no diva, just a great lady and everybody loves her. Now, we are very proud she became Swiss and choose us as her home. Not news to anyone Tina. You are the best, always were, and always will be. Very gifted to have had you in my lifetime. Thank you for all the wonderful memories.